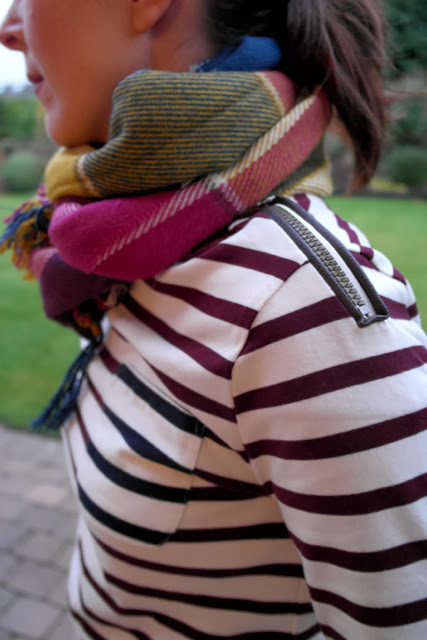 When I saw Sue in her burgundy breton, I had to have one too. After some googling, I found this one on the House of Fraser website in the sale and I'm loving it. 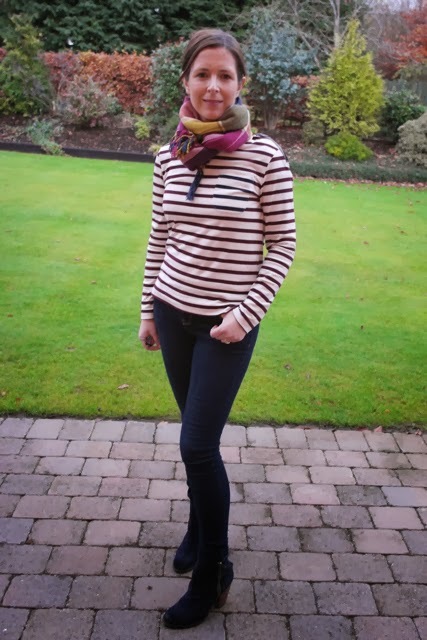 Not only does it have this lovely shoulder detail, the pocket has contrasting navy stripes. It also comes in a navy stripe with a burgundy stripe pocket. So it's made from a nice substantial jersey fabric though I will say, it doesn't have much stretch. I got a size M and it's on the neat side - definitely more a size 10 than a 12 but I wanted a couple of neater tops to wear with boyfriend jeans so I'm keeping. Though today, I wore with skinnies...my ankles were too cold! 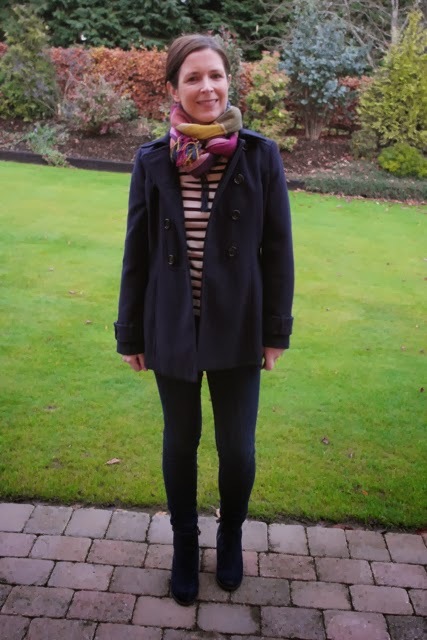 Wearing with my tartan checked scarf from the shop and navy Gok skinnies. 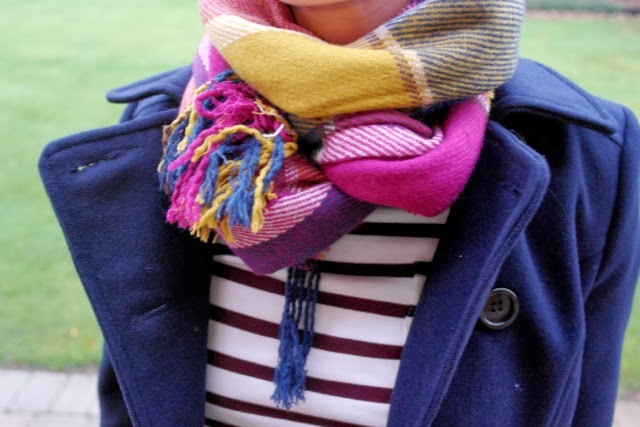 For heading out, I threw on my BHS navy pea-coat...voila...but I wanted a coloured handbag...a pink, a burgundy perhaps? In reality, I was late for the school run so it was a case of phone in the pocket and RUN! Hope you've had a lovely Monday and if not, at least it's almost over! A couple of things for my local readers. My choir, the Belfast Community Gospel Choir are singing in Lisburn Cathedral on Friday night and it's my first gig with them! EEK! There are still tickets available from Lisburn City Management Office if you'd like to come along and 'Feel the Joy'. We're also at Fisherwick on the 14th December for our fabulous Christmas concert though it's almost sold out so contact the Belfast Welcome Centre fast if you'd like to come along. Thats a fabulous top. i was lucky enough to stock up with a few on one of my resent trips to France. Ooh - thanks for the mention Avril and I didn't know you were after a burgundy Breton at all - they're lovely aren't they? A lovely change from the usual colours and perfect for Autumn. The fit looks really good on yours. I wouldn't worry about what it says on a label - it's the fit that matters and yours is fab - very flattering.